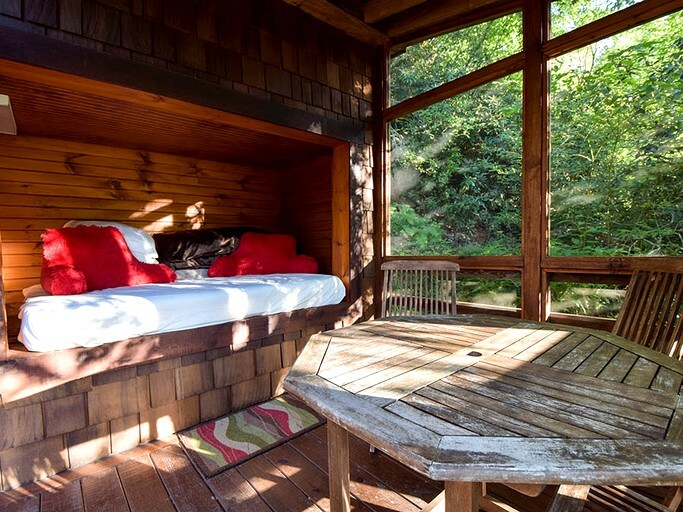 This cozy two-story cabin in the Blue Ridge Mountains of Georgia is perfect for two guests looking for a romantic riverfront getaway. 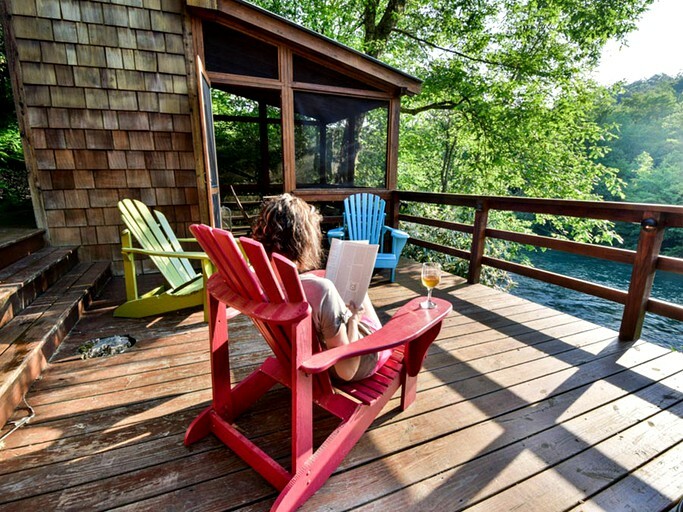 The cabin boasts a large deck overlooking the rushing Toccoa River and access to a salt water pool, so during hot days, guests have many options for cooling off! 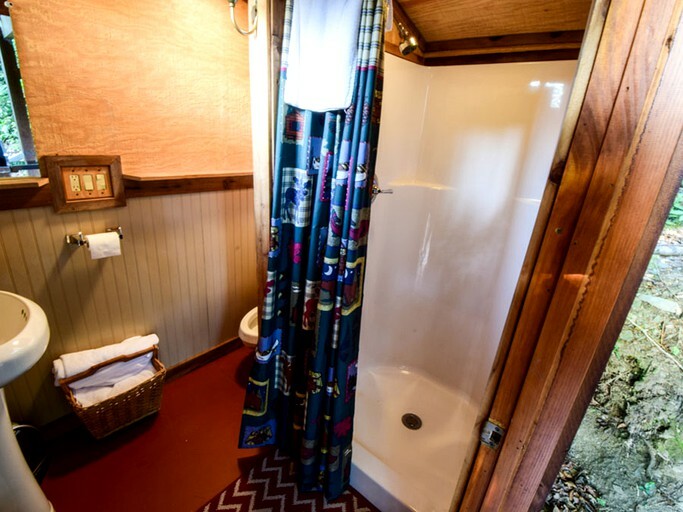 Inside, the cabin contains one bedroom and two bathrooms and is fitted with Wi-Fi, satellite cable access, as well as heating and air conditioning. 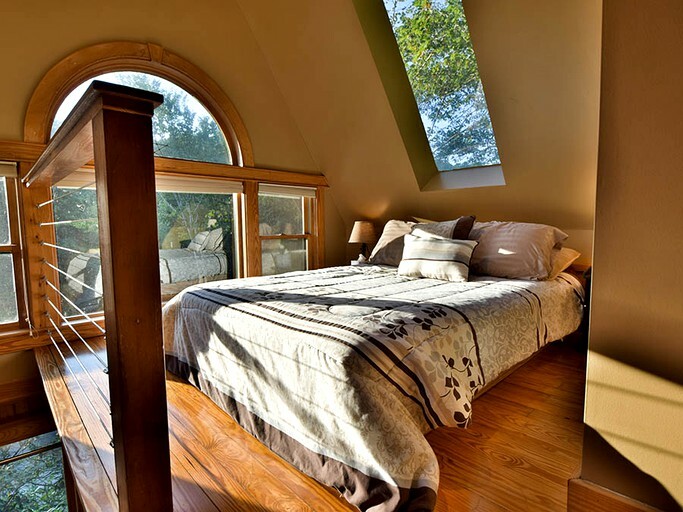 Guests will enjoy the spacious and sunny loft bedroom, accessible by a ladder, where they can start their day being woken up by the soft morning sunlight. 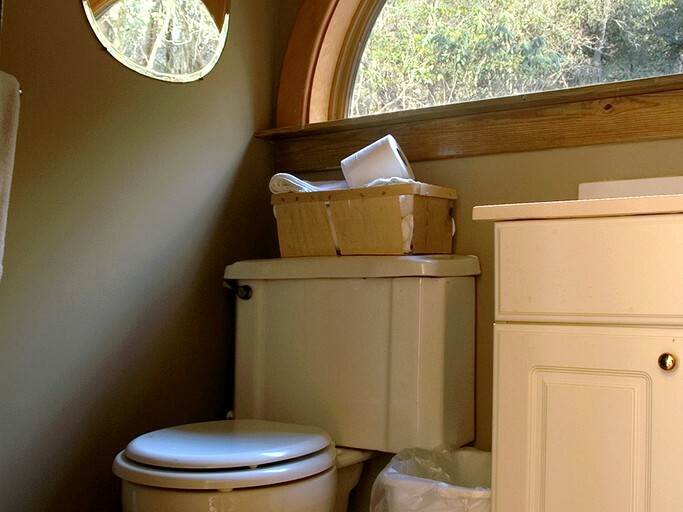 The main bathroom is located in the sleeping loft and features a toilet, a sink, and a stone finished walk-in shower. 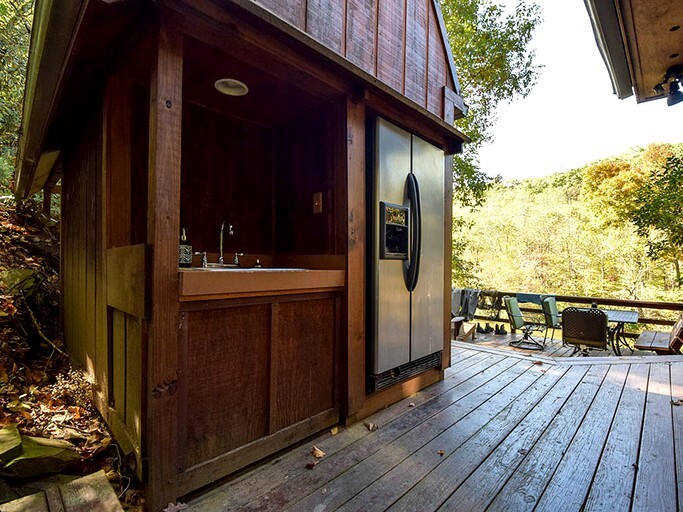 The second bathroom can be found on the deck outside. 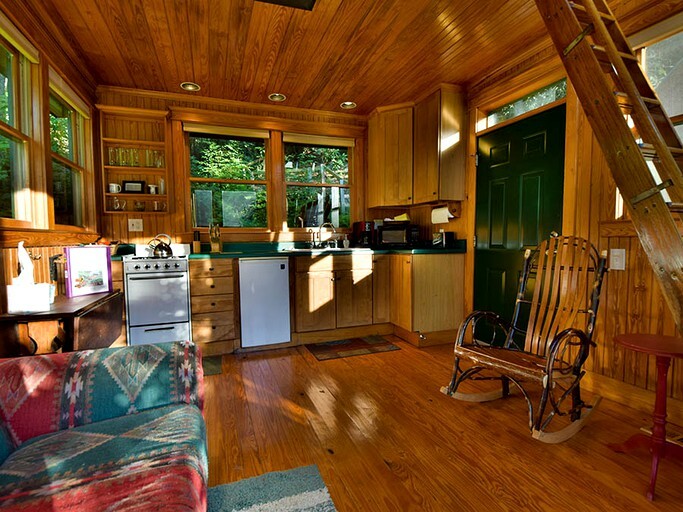 When guests spend time downstairs, they can relax in the living room that includes a comfortable couch, two rocking chairs, a flat-screen television, and a wood-burning stove with provided firewood. The efficient kitchen can be found immediately adjacent to the living area and includes everything guests will need to prepare meals throughout their stay. A stove, an oven, a small refrigerator, a toaster, and a coffeemaker can be found in the kitchen, as well as all necessary dishes, cutlery, and cooking utensils. 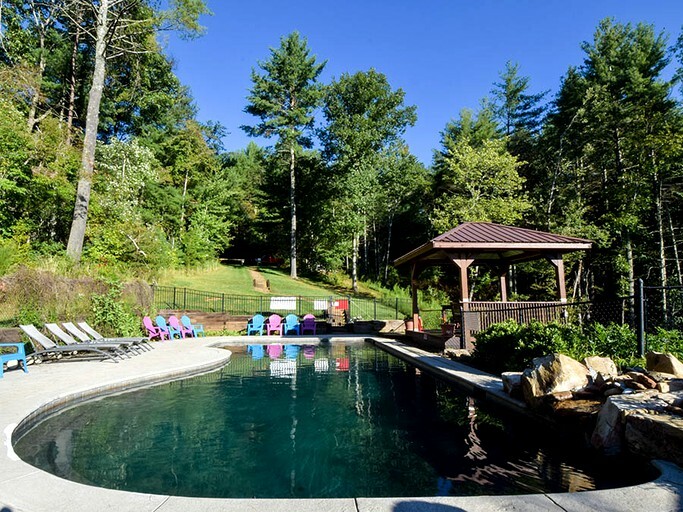 Guests have a plethora of facilities to enjoy at this property, which features 16 acres of property to enjoy and the pool and grounds are shared with the guests of the other accommodations on-site. 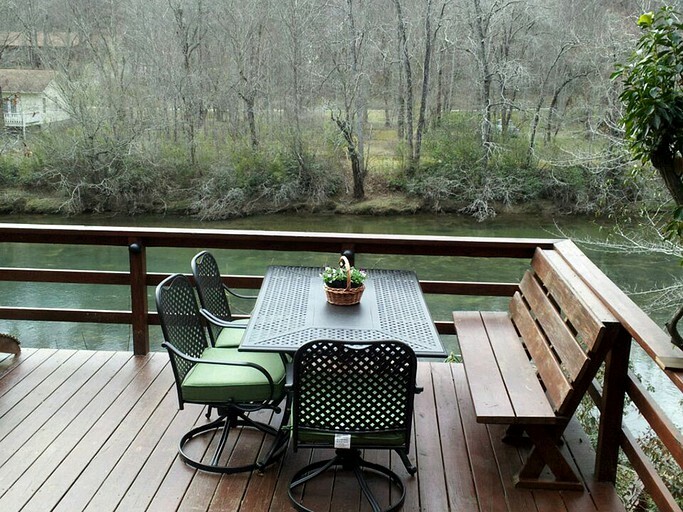 Outside, the huge deck overlooks the Toccoa River. 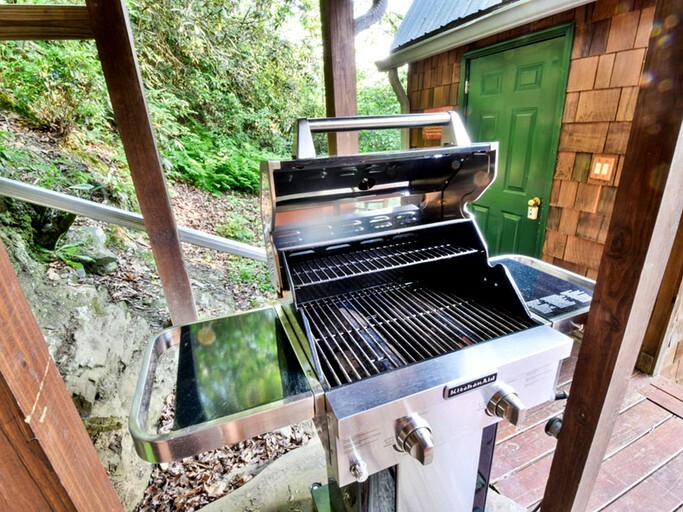 A gas grill is also provided in a covered portion of the deck. 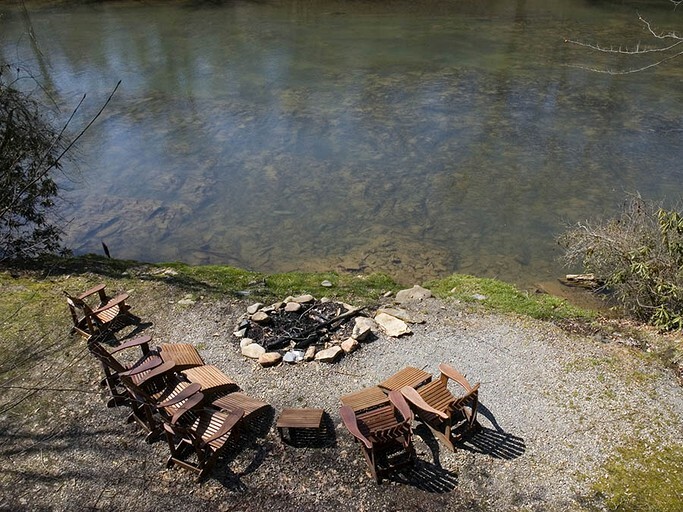 In the grassy field near to the house guests will find a fire pit with chairs gathered around it, perfect for a chilly night out to enjoy some s'mores. 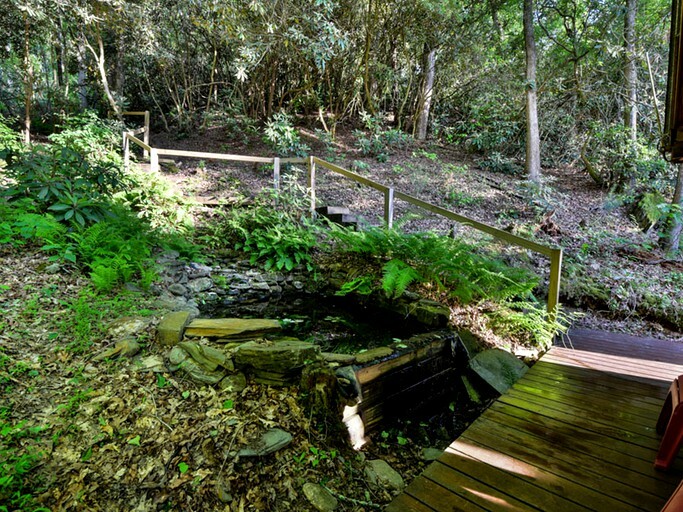 This property also includes a marvelous in-ground salt water swimming pool with a rock waterfall. 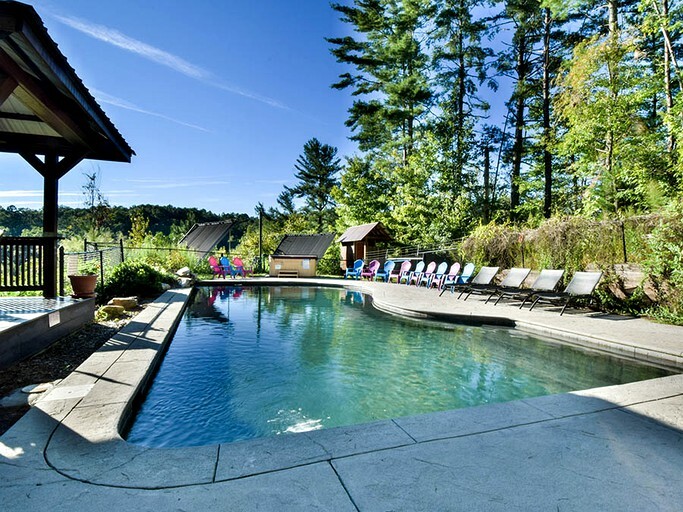 The pool is solar-heated, making it a perfect temperature from May to September. 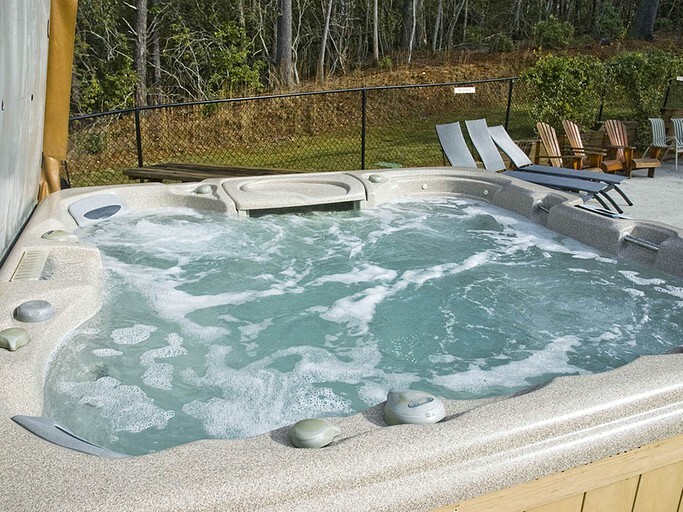 Additionally, a seven-person hot tub is located adjacent to the pool, with 42 jets to provide ultimate relaxation. Fresh linens are provided for all bedrooms. Satellite television service and wifi are provided for guests. 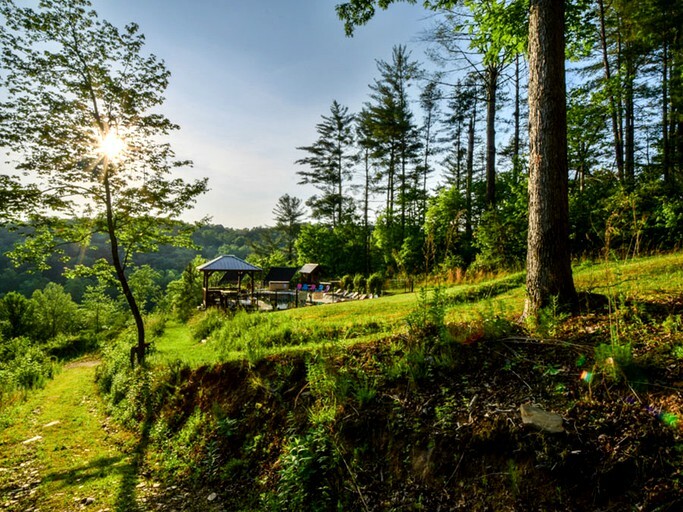 Located about 30 miles from the property is the Cohutta Mountains, which holds lush forests, cascading waterfalls, and crystal-clear rivers, as well as some incredible hiking trails. 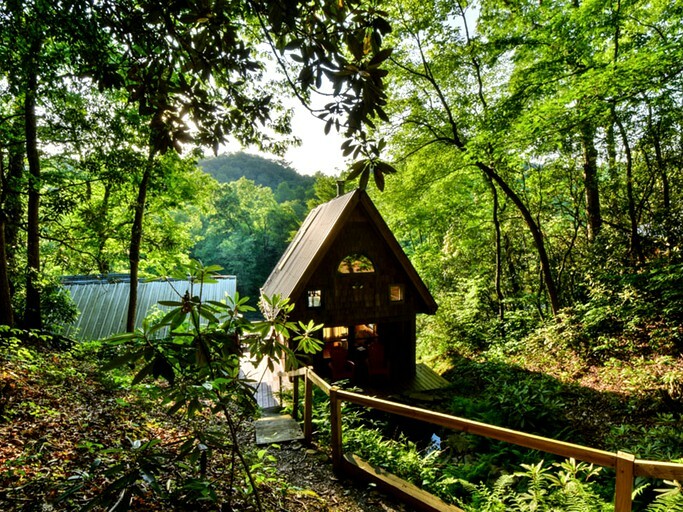 Guests can enjoy amazing backpacking adventures and whimsical hikes at this location. 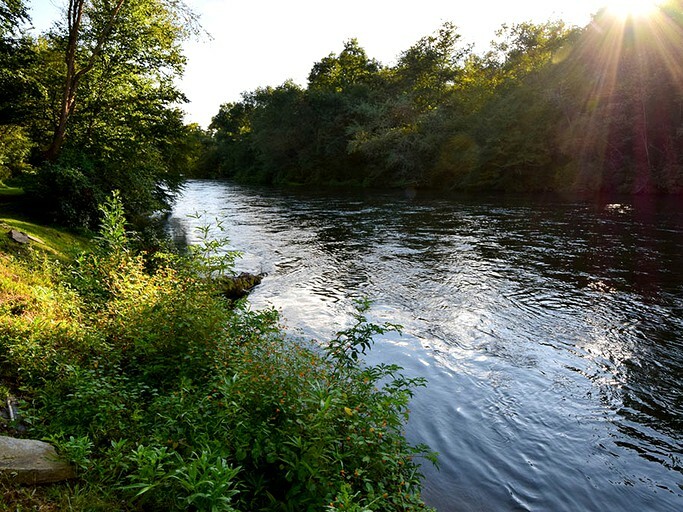 The Toccoa River Valley is a popular destination for those looking to embark in river tubing, kayaking and canoeing. 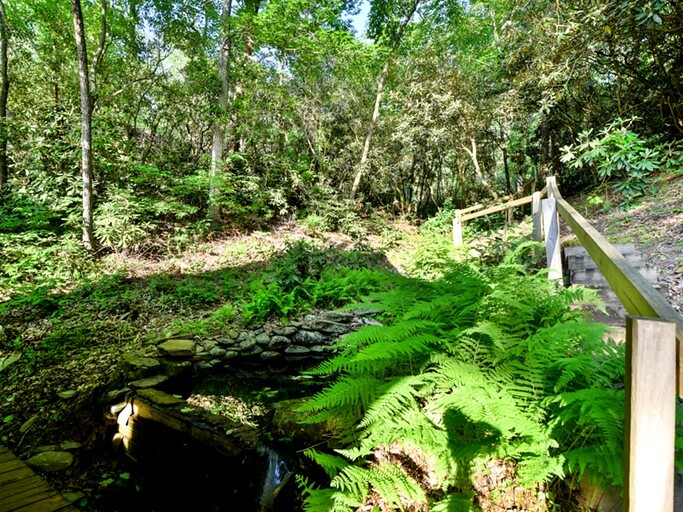 Guests can also take advantage of this property's easy access to fishing areas. For an experience of a lifetime, guests can take a chance at horseback riding at one of the many stables located only minutes from the property. 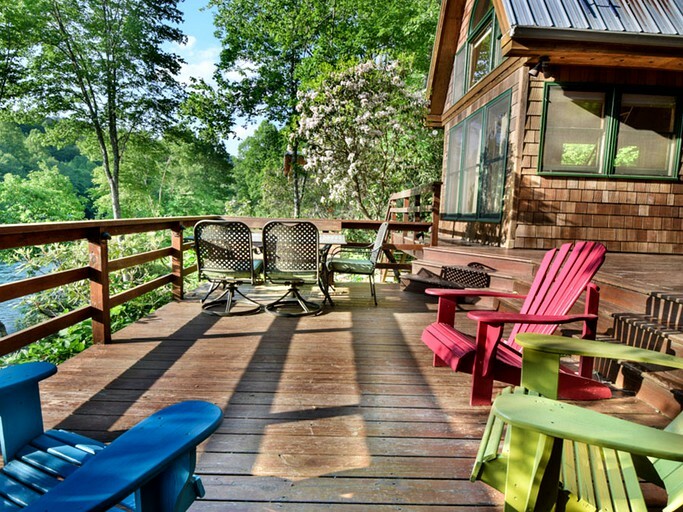 There are several fine-dining restaurants and places to shop in the town of Blue Ridge. A minimum two-night stay is required, and a five night minimum for holidays. A credit card deposit of $200 is required to secure a reservation. 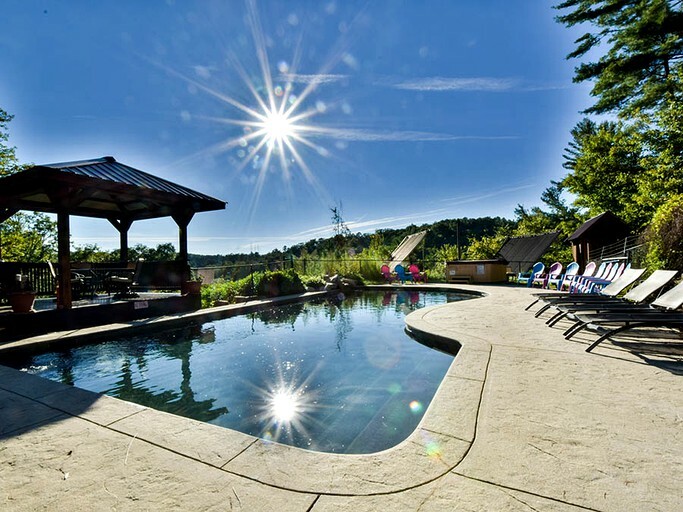 A $200.00 deposit is charged to the credit card provided for each reservation placed. This deposit can be refunded up to 30 days in advance, less a $75.00 processing fee. If a 30-day cancellation notice is not given, the property will process the remaining balance of rental due to the credit card provided up to 30 days prior to check-in. Guest agrees to abide by reasonable noise standards, and agrees not to disturb other neighbors. 10 p.m. is considered the beginning of overnight quiet hours. Guest further understands that due to the property's unique location along the Toccoa River valley, noise travels long distances (low noises can travel a half mile and loud conversations can travel two miles). 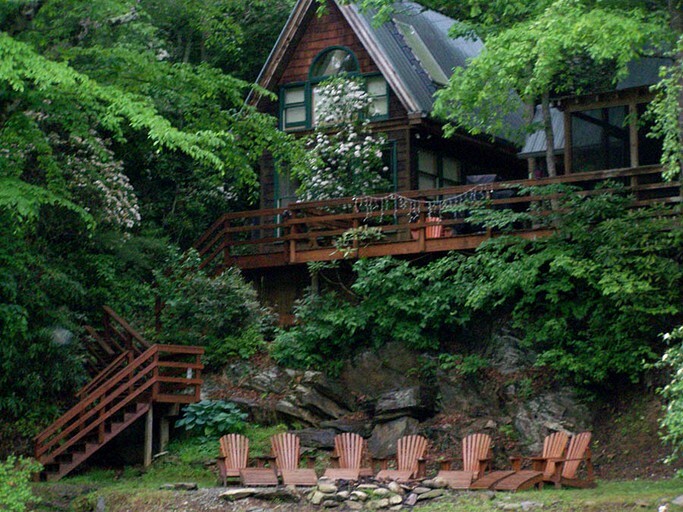 There are a dozen owner-occupied cabins within a two-mile radius and even though they are not visible, the owners are sensitive to loud noises, especially at night. This property does not collect a damage deposit. 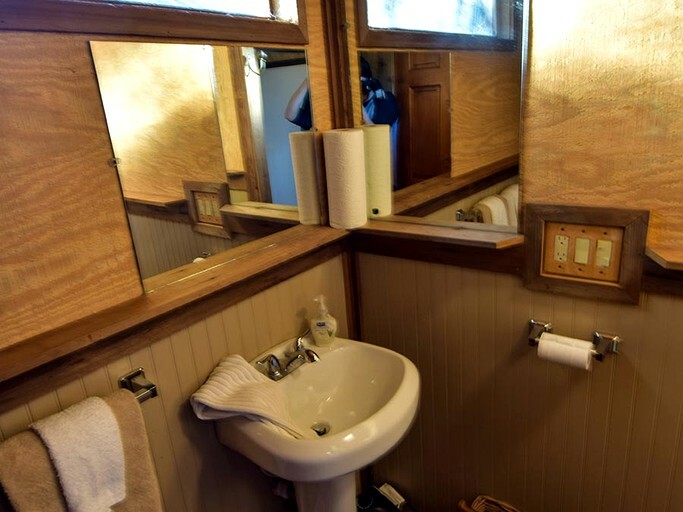 When staying at any the cabin, the guest is totally responsible for all damages caused by their party. Upon check-in, Guest must inspect the property and notify the hosts of anything already defective or damaged. 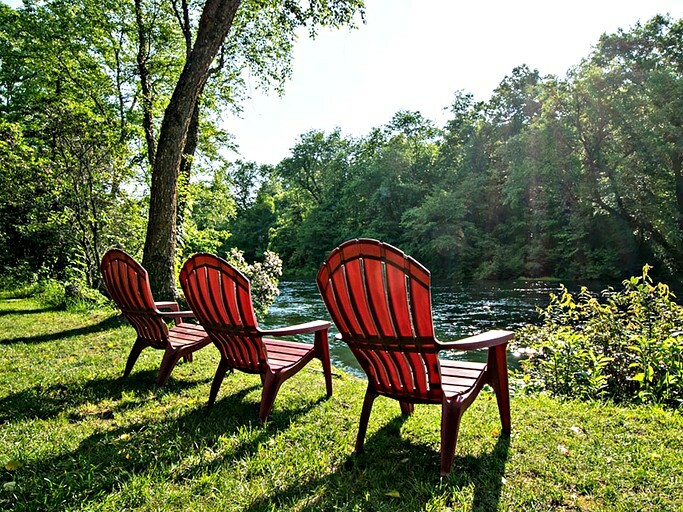 Guest agrees to reimburse the property with full payment within 10 days of departure for all repair and/or replacement required to restore the property and furnishings to the condition at the time of check in. Please do not move any furniture. Pets are not allowed unless they are individually approved by THP. 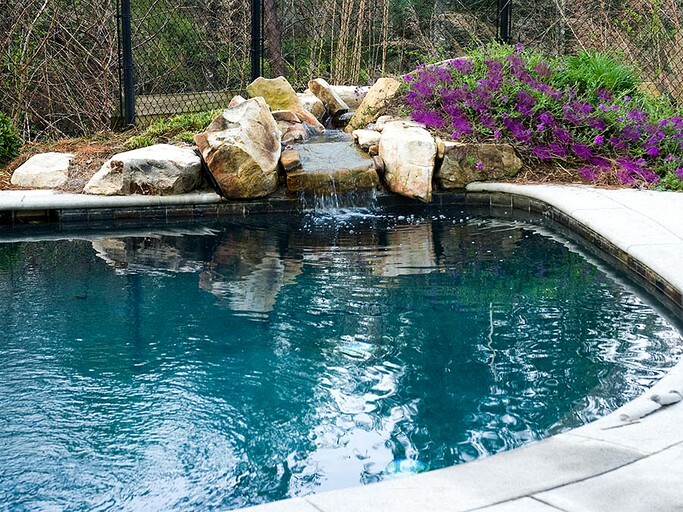 There is a pet fee of $25 per pet per night, and a non-refundable $500.00 pet fee if any pet occupies the property for any period of time without the prior approval of the hosts. Guest is totally responsible for all damage or additional housekeeping caused by pet occupancy. No smoking is allowed inside the cabin. All smoking material must be deposited in ashtrays provided at the balconies and decks. 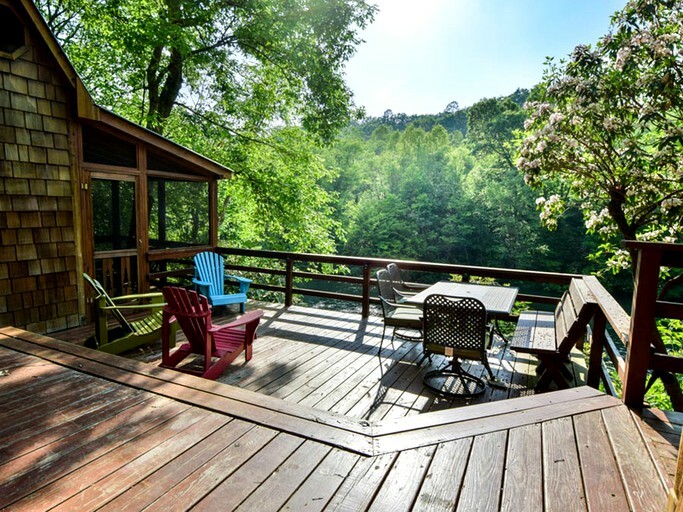 Guest understands that inherent risks exist with the property's location along the Toccoa River, and with certain paths and trails on the property, and agree to hold the property harmless against any and all claims, damages suits, or causes of action for damages arising from injury to persons or property, or loss of life sustained in or about the house/cabin and improvements thereon, or in or on the walkways, porches, decks, stairways, or roads in front of or appurtenant thereto by any persons whatsoever. Guest further agrees that the management and the owner shall not be liable for any personal injuries or damages to any goods, wares, or property, regardless of how such injuries or damages may be caused, or whether resulting from acts of negligence, or by actions of occupants of adjacent properties or from the action of the elements. This clause shall also apply to all recreational activities including boating, tubing, swimming, fishing, and transportation. 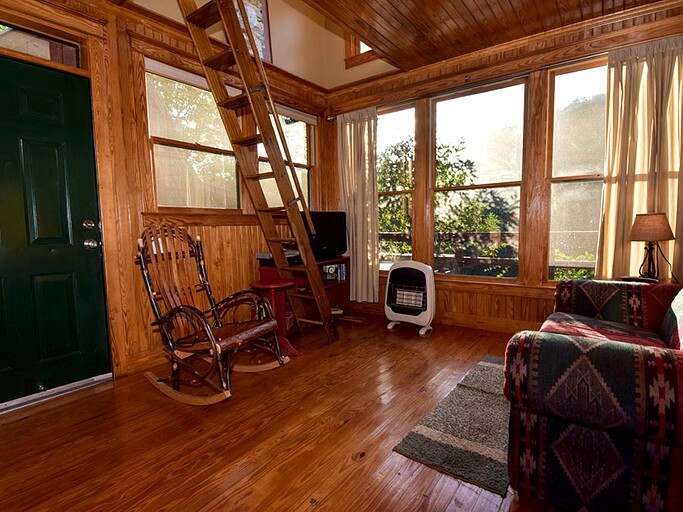 Guests of this cabin further understand the risks associated specifically related to access to the sleeping loft via the "ship's ladder." Guests accept complete and totally responsibility for use and release owner and management of any and all liability. Guest agrees not to remove anything (e.g. furnishings, appliances, maps, publications, appurtenances) from the property. The premises will not be sublet or assigned without the written consent of the property. The hosts shall have the right to enter the premises at reasonable times, and with proper notice, to examine or repair the property.